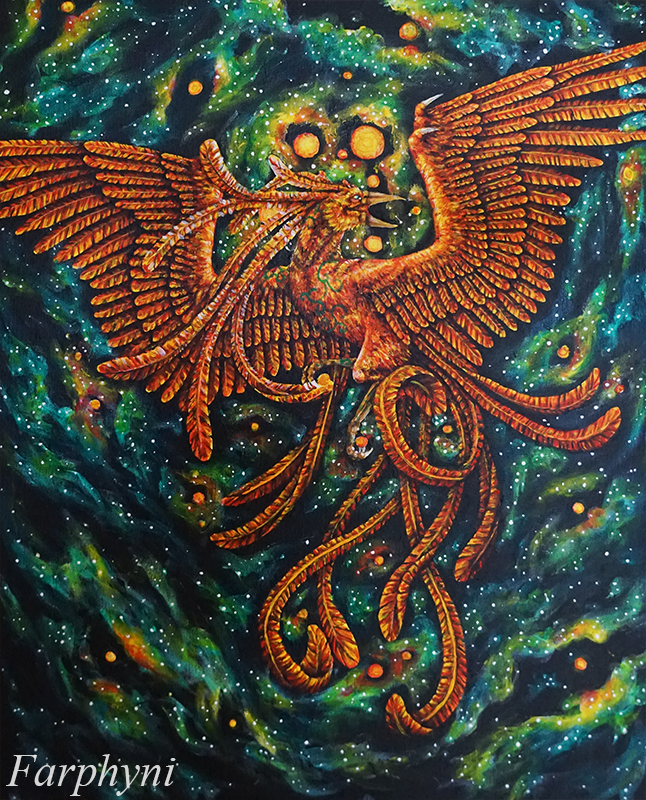 This phoenix-like creature is Farphyni (who represents my art/creativity and communication) in her “purest” form. just to remember where it lays. and so I found myself again. I won’t run, won’t hide. while wandering at the borders. I can’t fill my cup, until I empty all it has. I can’t understand what lays ahead, if I don’t understand the past. I’ll never fly again until I’m jumping off the cliff. And my art can’t truly be free until I’ve given up everything what is expected from me. and fly of in the night. and start over the rest of my life. – but you can see me: shining in the sky. It’s not too late, I have the rest of my life. as I found something I can’t deny. I can’t deny my roots, I can’t deny where I started, where I came from, who I am, what art meant to me – and still means. The background shows what art meant to me – and still does.